Bhuna masala is a convenience you would love having when pressed for time. I make a container full of it quite often for quick curries like alu matar, alu parval and the likes. One heaped tablespoonful of this bhuna masala is enough for 2-3 large servings of a curry. Recently when I made a large amount of this bhuna masala for a friend who is recuperating from a surgery, so that her family can cook the daily subzi conveniently and quickly, I was taken in for a surprise. Her family has roots in eastern UP, but they had forgotten the taste of the subzi of their parents home. Incidentally, this bhuna masala was used extensively at her place for daily subzi and as it happens, her home was visited by all her siblings and other guests who belong to UP. This bhuna masala got famous in all her khanadaan to my surprise. But the bigger surprise was, they all thought it is some kind of a secret recipe of mine, as I haven't posted it on my blog. So when my friend told me how they were assuming it to be a secret recipe, I told her to wait for a few days till I post it. And here is the recipe for the now famous bhuna masala. Simple procedure, takes about half an hour for this quantity but saves time for you daily cooking. The trusted mixie will be required and a few different pastes made in quick succession, one after the other and bhunoed well in a thick base kadhai. 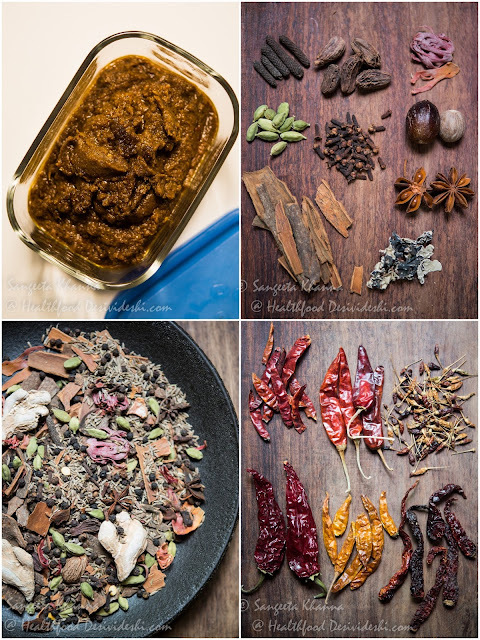 You certainly need a thick base kadhai, a sturdy spatula, a chutney jar of your mixer grinder machine or whatever machine you are using and about 30-40 minutes to do all the peeling, chopping and grinding and then some bhunoeing patiently. Make a coarse paste of the onions, that is the paste A in the ingredients list. Mean while heat the oil in the kadhai and tip in the cumin seeds and wait till they splutter. Pour in the onion paste into the hot oil and fry till the onion paste starts turning pinkish. Adding the salt at this time hastens the process. While the onion paste gets browned, make the paste B and keep it a separate bowl. This has to be added when the onion paste turns pinkish brown. Since browning the onion takes some time, proceed with making the paste C. All the dry whole spices have to be ground dry first and then a little water will be added so it becomes a nice smooth paste. Stop, check, add some water if required and whizz the mixie again to make a smooth paste. You might need to repeat checking and blending a couple of times. By the time this paste C is ready, the onion and ginger-garlic-red chilly paste would be cooked and pinkish brown. 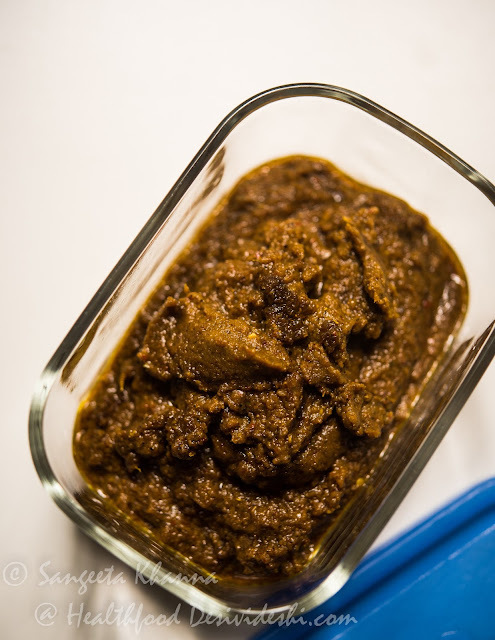 Add this spices paste to the cooking mixture and start mixing and bhunoeing over medium flame. While doing this, you would need to scrape the cooking masala from the sides of the kadhai and keep doing it till the browned parts are scraped and the uncooked parts get browned in turn. Some water can be sprinkled if you feel the cooking masala is sticking to the base. It is called deglazing technically, but scraping and quenching the dryness with a sprinkle of water is enough to understand for new cooks. Slowly, you would notice the browning of the masala paste and an aromatic whiff coming from the kadhai, the unmistakable aroma of bhuna masala indicates it is about to be ready. The visual indication of the masala getting ready is, it develops a glaze, a shining surface if not the separation of oil from the masala. The oils separates and starts bubbling on the sides if there is some more oil being used. This whole process takes about 22 minutes on medium flame, you can make the tomato paste in the meanwhile. Now is the time to add the tomato paste (if using). Mix well and cook for another 5 minutes or till the tomato paste cooks and gets homogenised with the bhuna masala. I normally add fresh tomato paste at the time of making the curry. Take off heat, cool down and immediately pack into airtight container and refrigerate. Keeps well for about 2 weeks if refrigerated well. I would suggest you to refrigerate while it is still warm. And do not keep outside for long, just take out required amount every time and place back into the fridge. The bhuna masala should be seasoned just for it's own quantity, so add salt accordingly. Whenever you have to make a subzi, add salt according to the quantity of the veggies used , the bhuna masala paste will have it's own. I am sure this recipe will be useful for many of you. Minor changes can be done when you want to cook different types of curries with the same bhuna masala. There is no chance of getting the taste or flavors repeated even if you use the same bhuna masala everyday. Like a methi matar malai can be cooked by adding some Kasoori methi and fresh cream to the bhuna masala paste and required amount of paneer and peas. Quick matar paneer with just a tablespoon of fresh cream added to finish. Or a quick chhole, boiled with required amount of this bhuna masala and finished with amchoor powder and chopped coriander greens. Rajma can be cooked too with this same bhuna masala, some butter and some more tomatoes added while boiling the soaked kidney beans would result into a nice rajma. The fresh vegetables impart their own taste to the curry being cooked and you can always use a few extra ingredients to make the curry different every day. I like sliced lotus stem just boiled with this bhuna masala a lot. May be with some green peas or soaked black chickpeas. All soy chunks curries taste really good with this bhuna masala, in addition to some cauliflowers and potatoes it is a classic daily grub for many of us. This bhuna masala can be frozen in an ice tray and then kept sealed in a ziplock bag, one or two cubes to be used as required. Feezers make our lives so easy sometimes. No more a secret. Make your daily subzi easy peasy. Some preparation on the weekends, some freezer friendly containers full of chopped vegetables and this bhuna masala and you life is well organised. Hi,You have said 15 -20 red chillies in paste B and then again 15 red chillies inpaste C.Won't that get very spicy? oops Shubha.. Thanks for pointing that out. That is meant to be in Paste B only. Correcting it. This is really good, Sangeeta! How long can you refrigerate and keep this paste? Thanks Rachna. I usually keep this masala paste for 2 weeks. I used to make my fresh masala paste as and when required earlier, but now as the husband has started carrying a lunch box, I have to cook quickly in the morning hours. This paste comes handy. Hi Sangeeta, I love your kind of cooking, this reminds me of different kind of food we use to eat cooked by my bua, she was from a village in Sultanpur district!